Healing Resonance Articles by Kristi Borst: Release What You're Afraid Of ... Take Flight! Release What You're Afraid Of ... Take Flight! What are you afraid of? If you're like most people, your answer is most likely not "the things that go bump in the night". Without realizing it on a conscious level, many of us go for years fearing not failure, but success. We fear following our heart's pure urging and living BIG. Yes, it's true. Yet there's hope and it's called "conscious awareness". When we can see that our fears tend to keep us small, we can move on to that greater sense of joy and living that becomes available to us when we cast aside our training wheels and soar on down the road. Remember those moments in your life when a physical challenge was paralyzing? Learning to ride a bike without training wheels is one example. For me I think of diving for the first time from a standing position. In learning to dive, I had started out dropping off the dock headfirst into the water from a kneeling position. Yet diving from a standing position seemed impossible; truly too scary. Yet somehow I did it. And you know what? I found intense joy on the other side of the fear. That thing I feared ended up being something that I truly love! Recently I was listening to the ministers' message at a spiritual community I visited. The message was focused on "transformation". The minister was using the metamorphosis of a caterpillar to butterfly as an analogy for transformation, yet my mind got an immense message out of a tiny segment of his sharing. He spoke of the caterpillar being born on a leaf and his existence being largely just eating and surviving on that leaf. I could see this as an analogy of surviving when the ego is calling the shots, rather than the heart. Wow, I thought. How many years did I do that? Just eat and survive ... not really seeing nor experiencing what was around me in plain sight?!? In the last few years I've done a lot of reading about metaphysical and spiritual things and have learned that many of the chains on my life were of my own making, held by the ego self. It is the caterpillar self, if you will, that is in fear and doesn't want us to move forward. Not because it's so happy where it is, but because it doesn't know or cannot believe that it is ultimately a butterfly. In nature, the caterpillar is lucky in a sense. He doesn't have free will ... the choice to stay a caterpillar. Something within beckons and he spins a cocoon. Once in that cocoon, the caterpillar basically becomes a whole new creature ... not just a caterpillar with wings, but a whole new creature with a different body. A free spirit with wings that allow it to fly instead of many legs that keep it rooted to the ground or a single leaf. While free will can ultimately be such a gift, for many of us it is what actually keeps us from living large, finding our true purpose and being happy. Perhaps we remember times, as children, we finished our chores or school work early only to be given more. Releasing your fears is not like that. You don't just get more fears. What waits around the corner is not more pain, unhappiness, struggle, but more JOY! When (not if) we are able to become aware of the chatter and negative self-talk of the ego, we have spun that first thread of our transformational "cocoon". We can start to change ourselves from the inside out. When we cannot only hear those inner urgings for growth and expansion, but also listen to and follow them, we reap huge rewards. We, too, find we are not only amazingly beautiful, but we also can fly! Think of those things you've feared and/or resisted. Maybe there are hurts or traumas you've held onto. They're running like an 8-track in the background of your life, sucking more energy than you've ever dared to realize. See the possibility that they are not the towering mountains you imagine. Facing them is more likely analogous to that stage when the caterpillar breaks free from the cocoon and spreads her wings and realizes she can FLY. Being conscious of our fears, how we are judging ourselves, looping negative self-talk is a BIG first step. Please understand in most cases (as in the diving example) our fears are actually keeping us from greater joy not from harming ourselves. Perhaps you know all of this and just haven't been able to release what is no longer serving you on your own. The private session intuitive energy healing "work" I offer releases these things for others with their permission and cooperation. Afterward, they can then see themselves and their lives in a whole new light. It is empowering and why I call my process Perspective Reboot®. Know that I AM here to help, as are others. It's truly okay to ask for help and to make the CHOICE to find your joy. Seize the day! Let go of the things you can. Take a step from Point A to Point BE. And, if you are unable to get there on your own, find an energy practitioner with whom you feel comfortable and take a glorious leap toward flying! 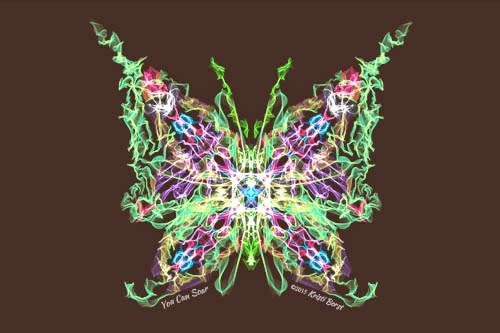 Image here is "You Can Soar" from my Healing Artwork collection ©Kristi Borst, all rights reserved.